discover our White Porcelain Christmas Origami Bird Ornaments in our range of christmas tree decorations and porcelain tree ornaments. these beautiful and highly decorative christmas tree ornaments are meticulously crafted by master artisans and are truly a joy to behold. decorating your christmas tree is one of the most beautiful holiday traditions. it is a unique opportunity to bring the family together and create memories that will last a life time. 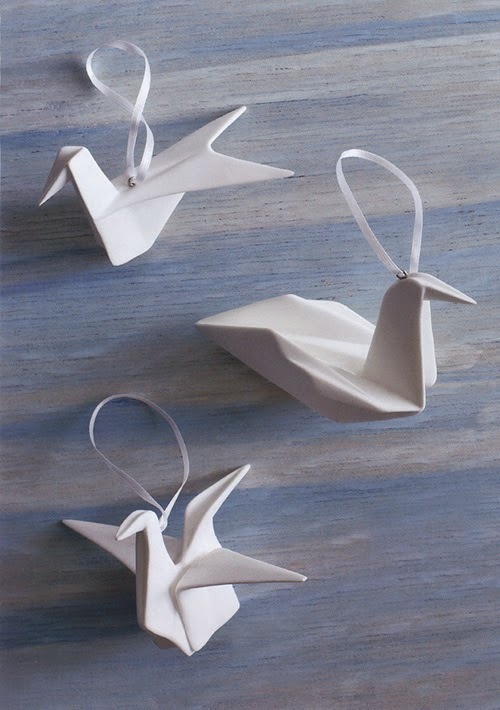 our origami birds, with their wonderful appearance, will look right at home in any interior. a nice set of heirloom quality ornaments sure to be enjoyed for many years to come. display them throughout the year to bring peacefulness to your home. we've got plenty of inspiring holiday and christmas decorating ideas which will make it easy to transform your house into a warm and inviting place for the holidays. we've brought together many christmas favorites and added a new and unique selection of holiday gift ideas which we hope will bring you much delight.christmas is all about creating the right atmosphere so check out our amazing collection of wonderful christmas ornaments, our attractive christmas trees, wreaths, christmas lighting, our beautiful christmas-tree shaped wooden advent tree, tabletop decor, jewelery and a wide variety of christmas presents. discover the best christmas shop around with a wide selection of meaningful gift ideas and unique and highly decorative interior. explore nova68 for the best in christmas and holiday decor.